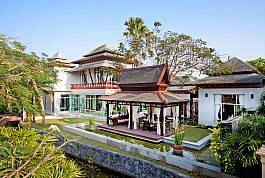 Baan Chokdee sits in a peaceful, private estate near Jomtien Beach. This recently refurbished 5 double-bedroom holiday home offers a comfortable open-plan living area which is matched when stepping outside. The private swimming pool with in-pool Jacuzzi and wicker furniture on the marble floor of its raised front patio are both perfect spots for relaxation. 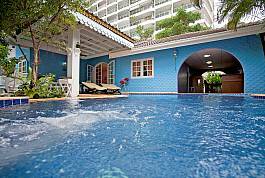 Situated just 200 meters from Jomtien Beach, this 5-bedroom townhouse set across 4-levels is a modern and convenient holiday rental option. Sleeping 10 people and being so close to the beach, bars, restaurants and shopping, this is one of the most central villas you can find. Mature gardens filled with exotic Thai plants, an extra-large swimming pool and the luxurious furnishings give this expansive five-bedroom villa at Pratumnak Hill Pattaya a very special feel of total relaxation – only 400 m from Cosy Beach. 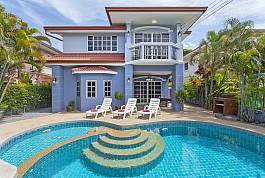 This modern 5-bedrooom villa is located in a secure development just over 1 km from Jomtien Beach. 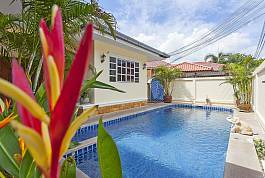 It was completely rebuilt in October 2015, has a colorful garden, swimming pool and sleeps 12 people in total (10 adults and 2 children), making it one of the most desirable Pattaya villas around. 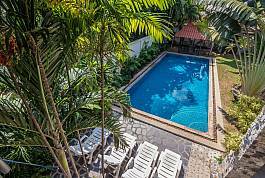 Located in a residential development just 300 meters from Jomtien Beach, this colourful 5-bedroom villa has lots of character, and with such a convenient location next to the beach and lots of international restaurants and a vibrant nightlife scene, this villa is close to the action. Situated amidst a stunning and exclusive villa development in the Bangsaray Countryside, a 5-minute drive from Bangsaray Beach, this 5-bedroom villa enjoys a modern and comfortable design, while benefitting from the development's vast amount of onsite facilities. 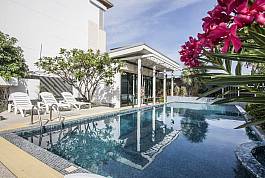 Located in a gated community in East Pattaya, 4.5 km from Jomtien Beach, this five-bedroom villa has a modern tropical design within a very private environment. Sleeping eleven people and coming equipped with a private swimming pool, open-plan living areas and lots of space to unwind, this is an ideal villa rental for a large family or group of friends.